The Middle East is a term which was commonly used by the British Empire – UK at the end of the 19th century and before the World War I. The main political issue at that time was the slow breakup of the huge Turkish Othman Empire and the political vacuum that this process created in the Central and the Eastern coast of the Mediterranean. This was known as the problems in the East or the “Eastern Question” referring in general to the Balkans. The British already referred to their colonies in India and the China Sea as the Far East and to the Balkans as the Near East and hence to the Arabs on the Eastern coast of the Mediterranean, under Turkish rule, as the Middle East. In their view the Middle East was a potential ally if and when the Turkish Empire will collapse. 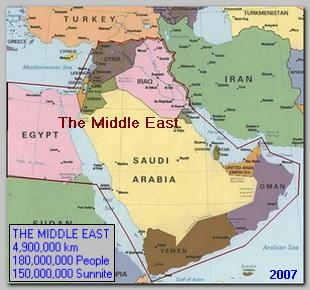 The borders of the Middle East are not clearly defined. Some include North Africa – the Maghreb in the Middle East or Turkey. We shall use the minimal definition: the Arab countries on the Eastern Mediterranean coast that were a part of the Othman Empire up to Turkey in the North, up to Iran in the East, the Arabian Peninsula in the South and Egypt in the West. The area stretches on approximately 4,900,000 km and roughly 180 million people, More than 150 million are Arabs and Sunnites, 170 millions are speaking Arabic as their native tongue. In general the Middle East is very homogenous in language, religion and ethnic identity. The minorities in the Middle East are living in the mountainous or remote peripheral areas. Most of the non-Sunnites are Shiites and most of the non-Arabs are Jews living in Israel and Kurds living North Iraq. There are 12 countries and the main heart land of the Middle East – the big cities, the political power and the economy is in the Arab Sunnites’ hand. The Middle East was always a bridge between West and East therefore strategically very important. It is much more important today as the Middle East contains the majority of oil reserve in the world. The political infrastructure and the borders of the different countries in the Middle East were established by foreign powers after World War I. The region suffers from straight line borders syndrome. Natural borders as a political evolution between two country neighbors are always very winding taking in consideration geography and political history. Straight lines were drawn with disregard to geography, ethnic complications and local political aspirations and were enforced by foreign powers according to their interests. Indeed some of the countries in the Middle East – Lebanon, Iraq, Jordan and even Israel, were an arbitrary caprice of France and Great Britain. In Lebanon and Iraq ethnic groups with historical rivalry were forced to share power in an artificial sovereignty. No wonder that these countries plunged to internal sectarian violence ever since World War I. The political infrastructure was established by others and not by the people of the area. The region suffered, and is still suffering, from a very aggressive and even violent foreign powers intervention in local affairs – whether it is France, Great Britain – UK, the former Soviet Union, USA and today’s Russia. Furthermore the local powers are not Arab – Turkey, Iran and Israel. The lack of basic national identity, except Egypt, the artificial borders and States, the enormous wealth combined with oppressive corrupted regimes and poverty combined with foreign intervention, all together make the Middle East a region of extreme violence, resentment and a hothouse for radical ideas including, lately, the Global Jihad. It is impossible to refer to the Middle East without the ISRAELI Arab conflict. A. It is the only, not Arabic country, in the region. B. It is the only country in the area that Muslims are the minority and non Muslims – Jews, are the majority in what is considered by the Arabs and Muslims as their domain. C. Only in Israel Arabic, the language that unites the region, is a secondary language spoken only partially. D. Israel is the sole democracy with a political culture that is misunderstood, very often, by her neighbors.